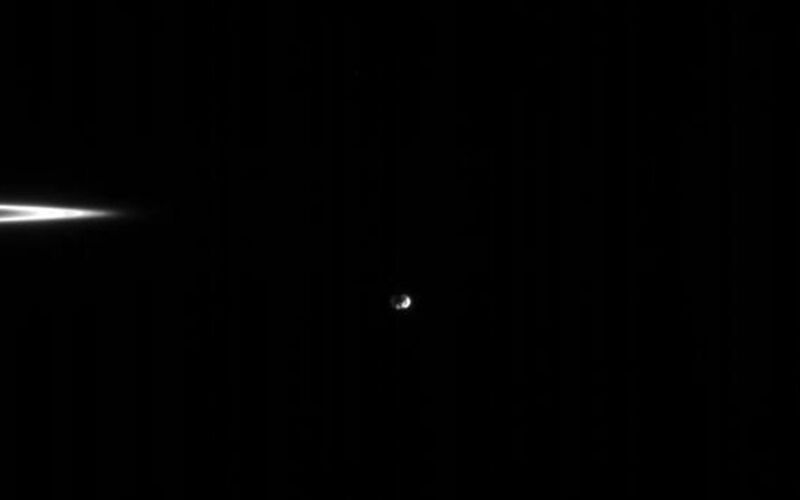 Outside the soft edge of Cassini's F ring, Epimetheus and Janus negotiate their nearly-shared orbit. The two moons' orbits are typically about 50 kilometers (30 miles) apart, and the moons actually change orbits every few years: one moon becoming the innermost of the pair, the other becoming the outermost. Epimetheus' diameter is 116 kilometers (72 miles). Janus' diameter is 181 kilometers (113 miles) across. The image was taken in visible light with the Cassini spacecraft narrow-angle camera on Sept. 8, 2005, at a distance of approximately 1.5 million kilometers (1 million miles) from Saturn. The image scale is about 11 kilometers (7 miles) per pixel on the two moons.